Self-guided walk on the Puy Route. GR65 between Conques and Cahors. The Way of Saint James pilgrimage is famous for hundreds years in Europe. 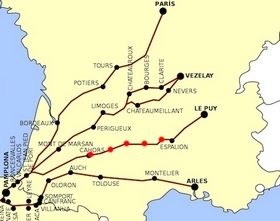 There are several ways to reach Santiago de Compostela starting in France. 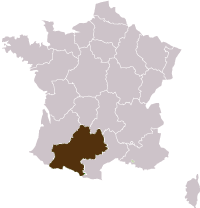 The Via Podiensis or La voie du Puy en Velay is the most frequented and passes first in Auvergne on the Aubrac plateau and goes on by Conques and Cahors as this program does. The hedged green meadows of the Rouergue precede the dry stone of the Limogne Causse. The vital lead is the Lot which will be crossed 4 times but which is always very close all along this stage of the Via Podiensis. The Ancient Roman via which used to link Caylus to Cahors has been called cami gasco or cami ferrat and will lead you to the Lot loop and the city of Cahors. Arrival in Conques. Enjoy the afternoon to visit the historical city and abbey. Conques – Livinhac. 23km (14 miles)- 6 hour walk. Conques is one of the nicest places of the via Podensis and is considered a jewel with its three tower basilica standing out of the pointed roofs. The Portal is an unforgettable real Roman treasure. The Way of Saint James leads to the Saint Roch chapel where the St James pilgrims can admire the Saint in pilgrim clothes. Decazeville is a coal mining city. In the past the Lot river enabled the transportation of coal on flat bottom boats to Bordeaux. Livinhac – Figeac. 25 km (15.5 miles)- 6h30 walk. Visit the roman St Felix Church in Montredon and finish your day in the beautiful city of Figeac where Champollion was born. Figeac - Grealou. 20.5 km(12.8 miles) - 5h15 walk. Can be split into 2 walks. We quickly leave the edges of the Cele to climb up the Causse, this limestone plateau where can be found the so charming dry-stoned shephard huts named Cazels or Bories. This stage is long but on the descent down to the Lot, do take the time to visit the romanesque Church of Grealou. Grealou - Limogne-en-Quercy. 28 km (17.5 miles) - 7h00 walk. Here, the rain infiltrates in the heart of the earth to give shape to an underground network of streams running through caves some of which offer rupestrain paints. This stone kingdom also conceals a lot of dolmens and Limogne is famous for its truffles market. Limogne-en-Quercy - Mas de Vers. 21km (13 miles)- 5h15 walk. Ancient windmills, wells, wash houses..mark out the way along this stage. The barren loneliness of the Causse hides a discreet life in the hamlets and fortified farms. Mas de Vers-Cahors- 18 km (11 miles)- 4h15 walk. The Cami Ferrat, this ancient way between Cahors and Caylus is the way you take to reach the Valentré Bridge in Cahors. Night in Cahors. 2 and 3 star hotels and Guest Houses (depending upon availability). Dinners and breakfasts are in your accommodation and can be "table d'hotes" with other guests. 1 road book for 2 persons with the description of your program and full detailed walks with a 1/100000 walking map. The transport of your luggage from hotel to hotel. The trip to Cahors. All lunches. Everything else that is not listed under "Price includes". Customize your program : add 1 more night ! shorten the stages, combine with another section. Access : Cahors train station. Customize your stay ! Combine with another section, add or remove 1 night or more !